The St Petersburg area has several coastal-barrier islands. Just behind Alaska, Florida has the 2nd most islands in America. Our tour will showcase some of South Florida’s popular beach communities. Afterwards, stay tuned for an exciting video. Starting at the southern end of Gulf Boulevard is the seaside community of Pass-a-Grille Beach. 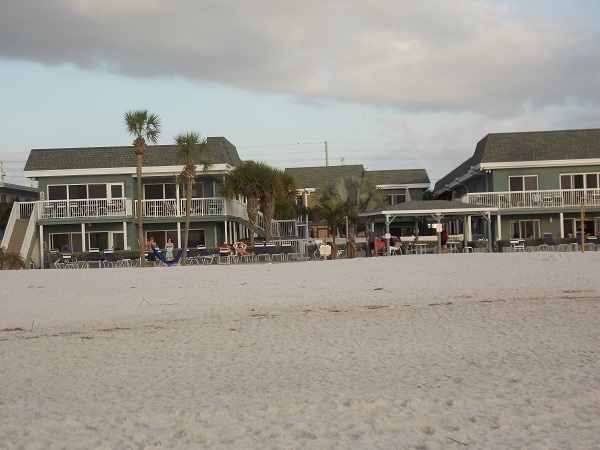 This small community sits on the tip of St Pete’s Beach between the Gulf of Mexico and the mouth of Tampa Bay. There are lots of smaller beach communities like this one on islands that reside along St Petersburg’s gorgeous coastline. 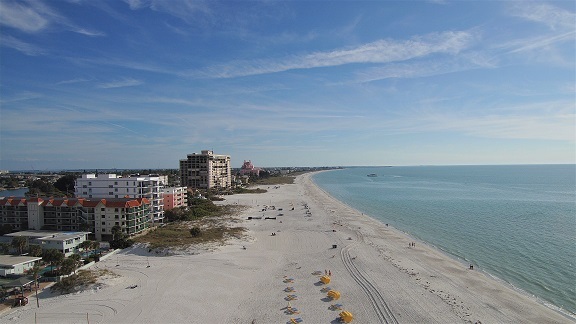 North from Pass-a-Grille Beach is the island’s namesake – St Pete’s Beach. 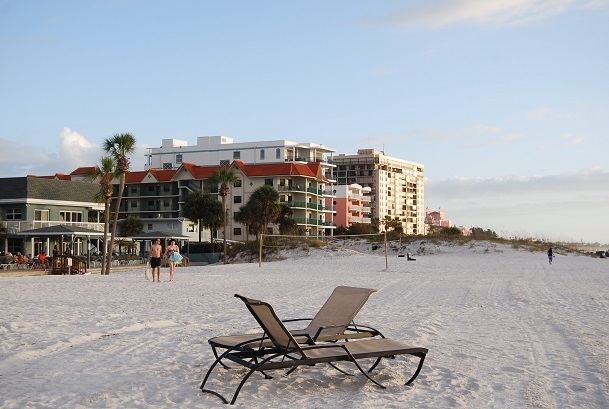 Florida’s beaches are famously known for sugar fine white sand and Caribbean fed water. The soft textured sand maintains a comfortable temperature and is very easy to walk on. This is not to say these micro-fine granules won’t show up in places you never expected them to be. Florida’s bleached white sand fades effortlessly into the calm Caribbean Gulf water. The Gulf of Mexico has such a shallow shelf that it allows for subtle waves and less undertow. You can venture out 50 or more feet before the water reaches your chest. These benefits alone are great for families who have younger children and people that aren’t quite sure about their swimming abilities. There are a variety of resorts, condos, and timeshares that line the island’s picturesque shoreline. They range in size, shapes and amenities. There are condo styled accommodations that are geared towards lengthier stays. 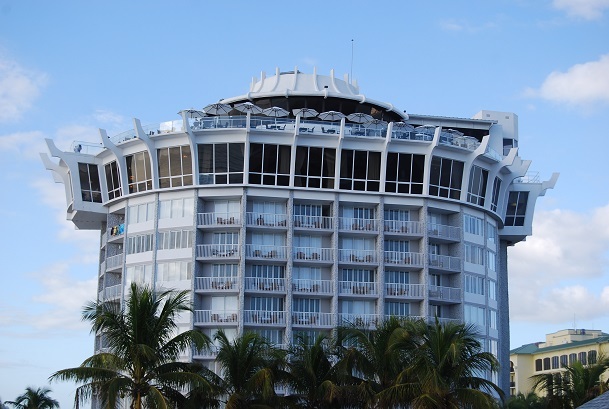 But if your planning a quick getaway or vacation, there are numerous places like The Grand Plaza Hotel & Resort (shown upper-right) to select from. Most of the condos are fully equipped and supplied with everything their guest will need for a short or extended stay. They offer similar on-site amenities as there neighboring resorts like a common pool, sitting area, and beach access – if they aren’t directly on the beach already. The hotels and beach resorts provide various types of rooms that have a bed, bathroom and a small living area, to junior and full-on suites with a mini-kitchen. Most of the hotels and resorts have an on-site combination restaurant and bar. They are usually situated on or near the beach with fabulous views. 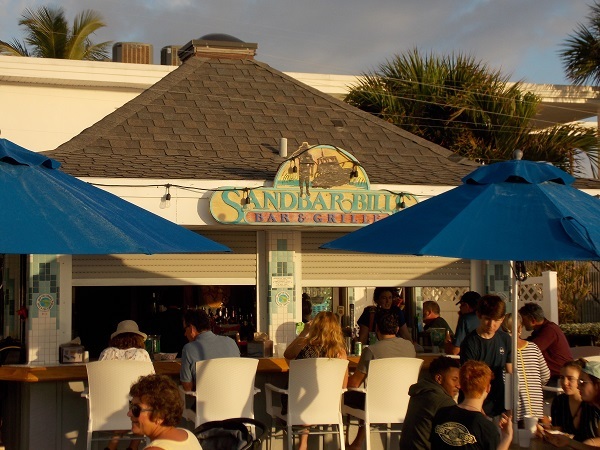 The Bon-Aire Resort Hotel has Sandbar Bills Bar & Grill (shown above-left) that offers its guest beach-side food and beverages. Traveling further north, you will crossover onto the seaside community of Treasure Island. 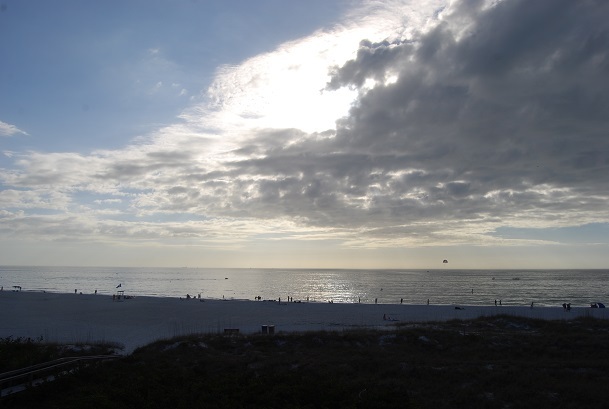 Here is another picture-perfect postcard community which includes Sunset Beach and St Petersburg Municipal Beach. 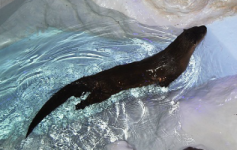 Both locations are for people who want to enjoy a day having fun in the sun. Treasure Island is an elongated – barrier island that is approximately 3.5 miles in length and less than a quarter mile at its widest point. This quaint little island obtained its name from a hotelier who claimed to have discovered several buried treasure chests. One thing lead to another and the name became synonymous with the island. Treasure Island’s sunny skies and white powder sand beaches are a ‘hot spot’ for people looking for relief from their hometown’s chilling winter temps. Again traveling north and crossing over John’s Pass, you land on another unique island that stretches over 14 miles. Just over the bridge is John’s Pass Village & Boardwalk. 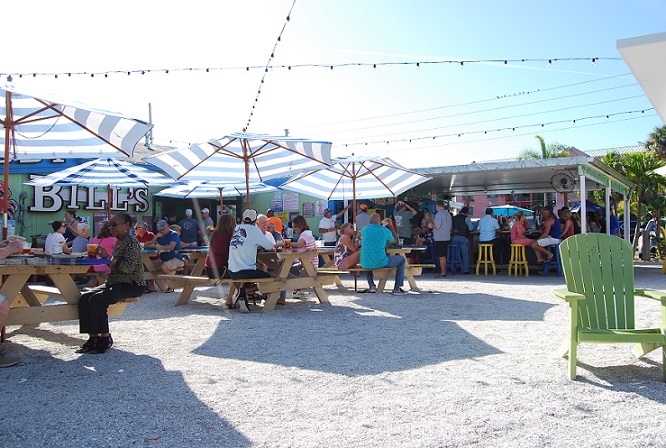 The village features plenty of boutique shops, bar & grills, and views of Boca Ciega Bay. 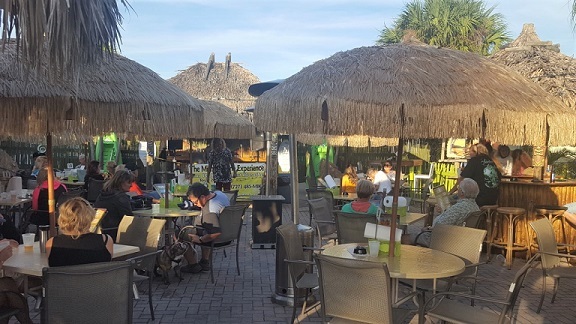 Being known as the “Sunshine State”, most all the eateries along the coast have outdoor patios with tables that have palapa – tiki like umbrellas. Pull up a chair, order your favorite beverage, and enjoy the live entertainment. When the urge hits to satisfy that hunger craving, don’t hesitate to try the local cuisine. Like the last few visited, this narrow island is also home to several coastal beach communities. 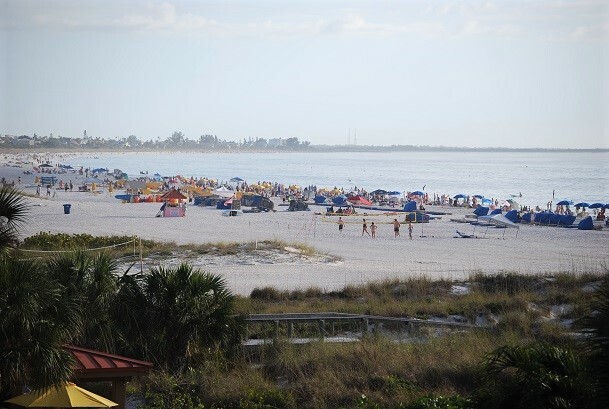 They include Madeira, Redington and Indian Rocks Beaches. These and other smaller communities have their own local markets, shops of all sorts, and favorite watering holes. Right after Gulf Boulevard goes from a spacious four-lane thoroughfare down to a neighboring 2-lane road, you come upon Indian Rocks Beach. This quaint but very tight-knit community of just under 4,300 residents is home to several popular bar & grills. 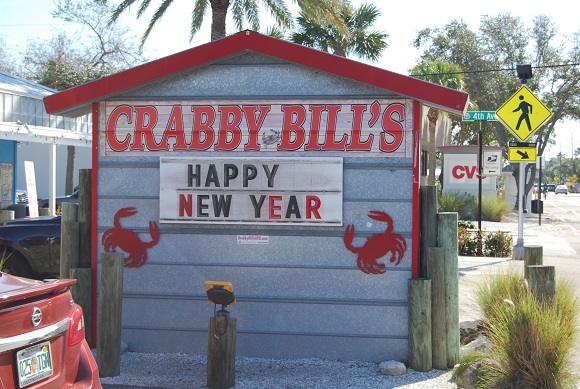 Crabby Bill’s is one of those favorite hangouts for not only the locals, but vacationers alike. This hometown establishment has deep roots that extend back as far as 1938. 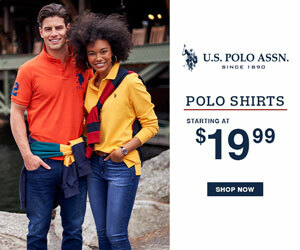 It definitely shows its historic appreciation and laid-back atmosphere. 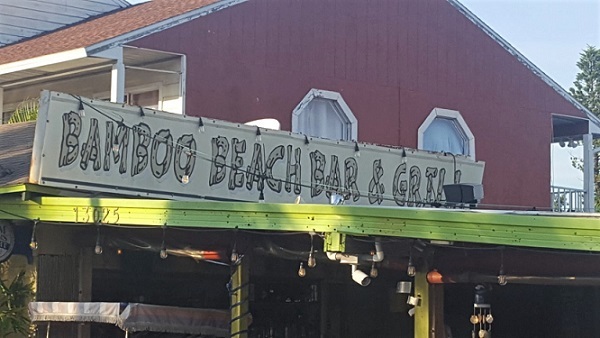 Crabby’s, a sincere name given by the locals offers great beverages and authentic local cuisine. 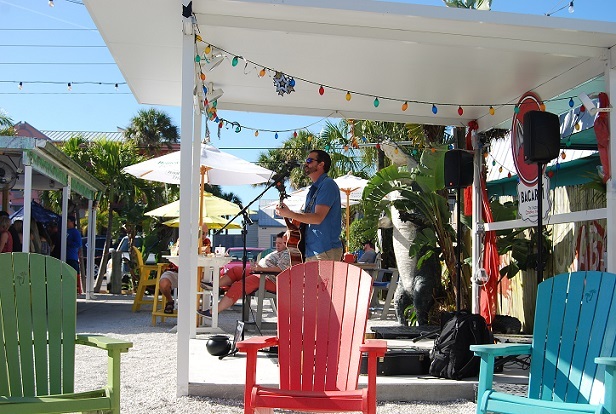 Crabby’s and other nearby establishments provide live entertainment and “Happy Hour” specials almost every day of the week. Fun people and fun places provide fun times for all. Florida’s Southern Gulf coast offers great year-around weather, beautiful beaches, and plenty of outdoor amenities. The entire area offers plenty of activities on and off the islands. 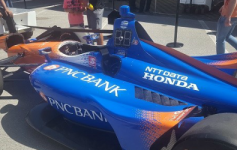 An easy 30 minute drive east is St Petersburg’s downtown and the Tampa Bay area. 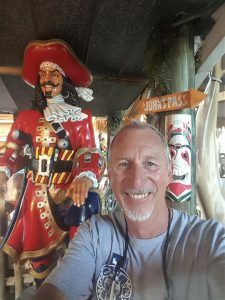 If you haven’t already taken the time to read You, Me and The Dock’s – St Petersburg, Florida’s Downtown Area travel article, it is highly suggested to do so. Take a moment to watch this 3 plus-minute video that briefly pans across St Pete’s Beach and Treasure Island. 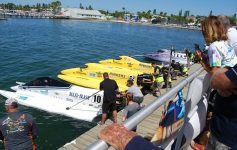 We here at the travel site, “You,Me and The Dock” are pretty sure you will enjoy the ‘birds eye view’!